When a whale dies or a tree is washed out to sea, it will eventually sink to the deep seafloor. The carcass or piece of wood prompts a feeding bonanza with animals coming from near and far for a meal or shelter. This is what is termed an organic fall. Organic-falls support specialized communities within the deep sea, yet large-scale patterns of connectivity and biodiversity between these ecosystems have remained largely unexplored. Bone-eating Osedax polychaete worms and the wood-boring Xylophaga bivalves, play an important role as ‘ecosystem engineers’; driving the decomposition of the substrates whilst increasing the organic matter and habitat availability to a wider community of deep-sea organisms. There have also been hundreds of new species discovered at organic falls. My Ph.D. research focused on the ecology of organic falls, Osedax worms and Xylophaga clams and the biogeography of these habitats in our world’s oceans. My fieldwork has led me to wrangle with smelly whale bones and wood in Antarctica, the Bahamas, the Cayman Trench, Hawaii, Washington and Oregon. 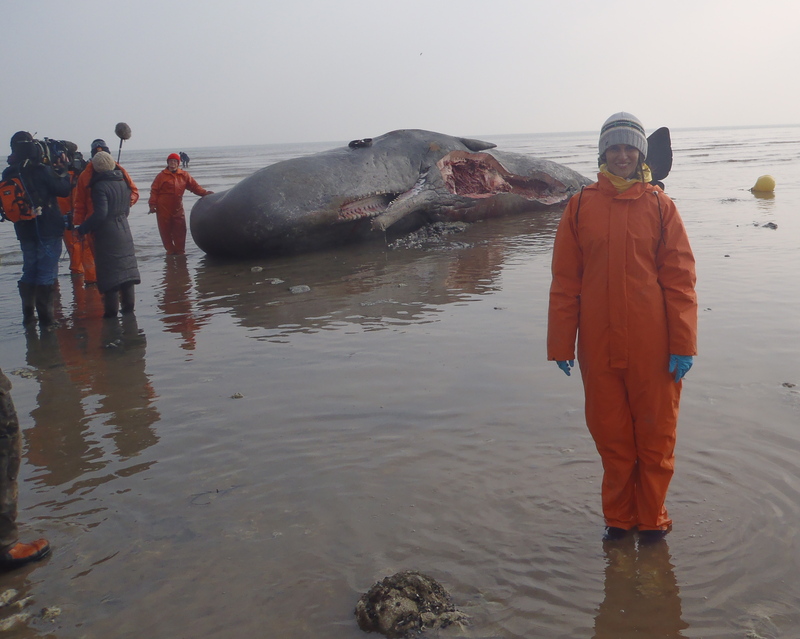 I’ve also helped dissect a sperm whale, described several new species of Osedax, micro-CT scanned wood recovered from the deep-sea, and analysed the first natural whale fall found in the Southern Ocean. I still try to work on organic-fall projects in my limited spare time and hope that in my future deep-sea career, I can resume this type of research! Dissecting a porpoise found dead on a UK beach at the Natural History Museum, London. Photo credit: Diva Amon. 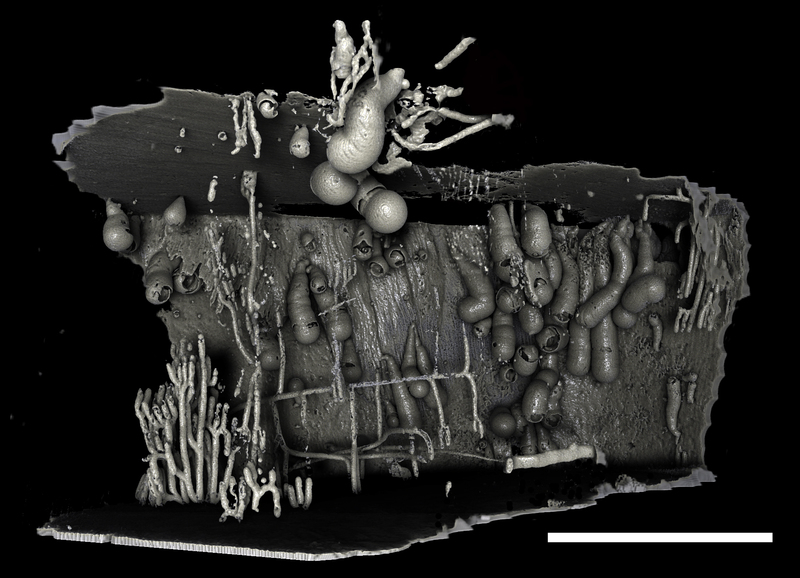 Micro-CT scan of a block of wood showing the burrows of Xylophaga murrayi, a wood-boring mollusc. Photo credit: Diva Amon. 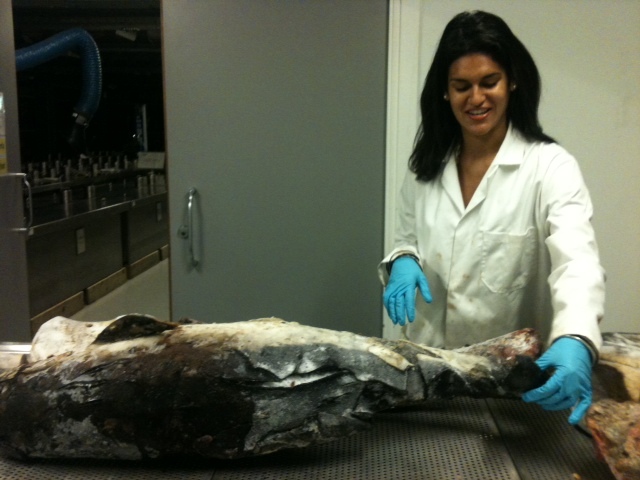 Still clean prior to dissecting a sperm whale that had stranded and died in Kent, UK. Photo credit: Diva Amon. Eight new species found living on the first natural whale fall to be discovered in the Southern Ocean. Photo credit: Diva Amon. Below is a video of a micro-CT scanned piece of wood recovered from 500m depth in the Bahamas. The brown is wood, grey are the burrows (air), and green are the wood boring Xylophaga molluscs.